Note: Do not use export to create a backup copy of your Team Password Manager data. Use the proper backup procedure to do so: How to make a backup. 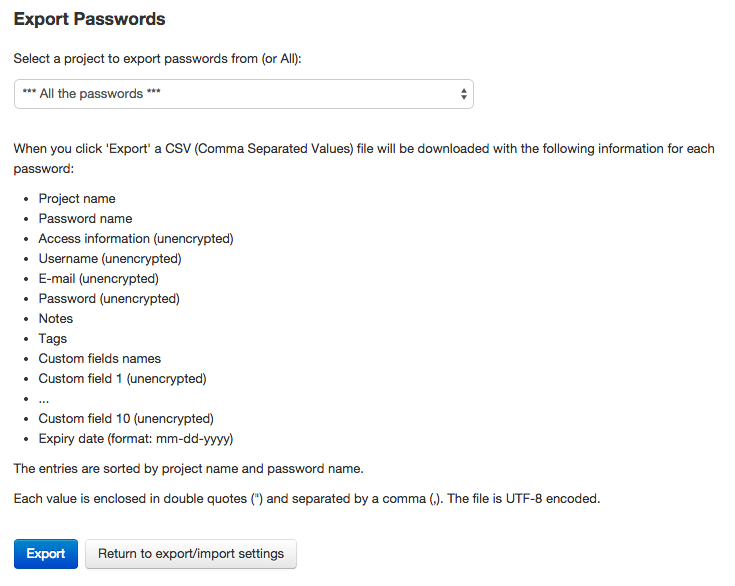 Team Password Manager lets admin users export all passwords (or passwords from a selected project) to a CSV (Comma-separated Values) file. IT users can also export passwords, the ones they have access to. The passwords are sorted by project name and password name. Each value is enclosed in double quotes (") and separated by a comma (,). The file is UTF-8 encoded. "Project name","Name","Access information","Username","E-mail","Password","Notes","Tags","Custom fields","Custom 1","Custom 2","Custom 4","Custom 5","Custom 6","Custom 7","Custom 8","Custom 9","Custom 10","Expiry date (mm-dd-yyyy)"
"Software","Server admin","192.168.0.34","admin","","test","sample notes","tag1,tag2","custom1,custom2","custom value 1","custom value 2","","","","","","","","",""
Exported files contain a first line with the names of the fields. If there's no datum for a field, it's exported as "". Each value must be enclosed in double quotes (") and separated by a comma (,). There must be no field headers (if they exist they will be imported as normal passwords). The file extension must be csv or txt. Likewise, if a field contains a backslash (\), a backslash must be prepended to it: \\. Example: to import "DOMAIN\user" you need to encode it like this: "DOMAIN\\user"
Custom fields are imported as type "Text". See Custom fields in passwords for more information. First, the file with the passwords to import is uploaded to the server. The import process will then read line by line and will look for the 'Project name' from each line in the database. 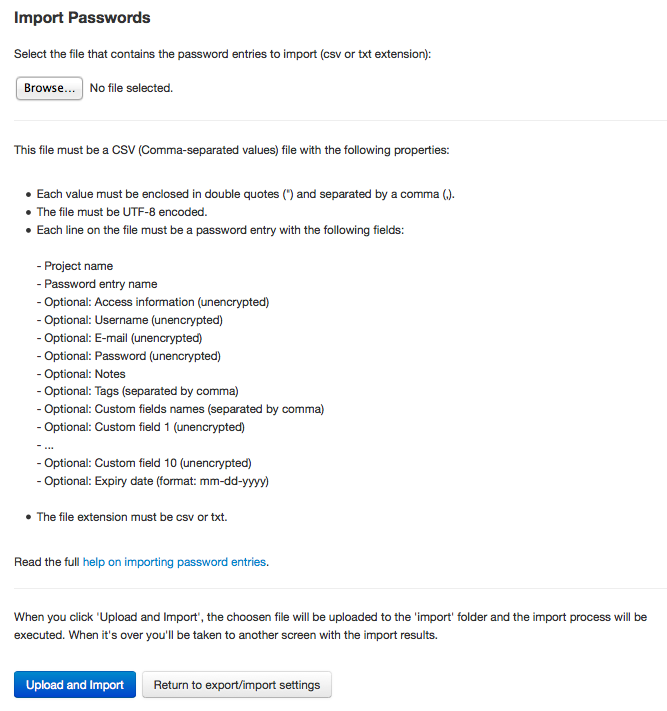 If the project exists, it will import the password in the existing project. 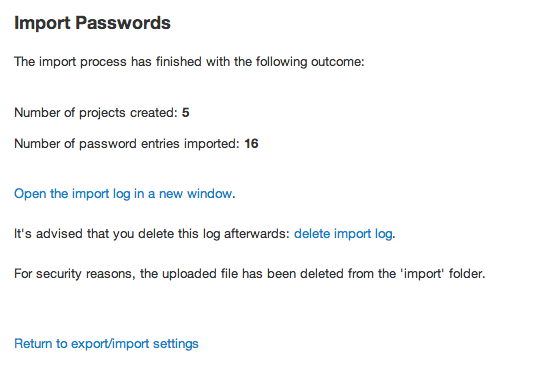 If the project doesn't exist it will be created (and then the password imported in the new project). Projects created by the import process will have 'Grant access to this project to the following users and/or groups' as their security setting (and no user or group checked). If the password name already exists in the project, it will not be imported. As you can see, the information in the database is not overwritten, only new projects or passwords are imported. During the process, a log file is created detailing what has happened in each line. You can download this log file at the end. At the end of the process, the uploaded file will be deleted (for security reasons). For the import process to work, a folder called 'import' must exist in the root folder of Team Password Manager. Also, this folder must be writable. The import process will prompt the user to create this folder if it doesn't exist.